Taking the train across Canadiandollarbingo.com is it’s the best way to get you started in the New Year. A fantastic experience, bigger prizes & increased odds are waiting for you! Take the route from Newbie to Depositor and start winning big. Our Money Bingo Train departs every Monday and returns to the main room station every Sunday at midnight. 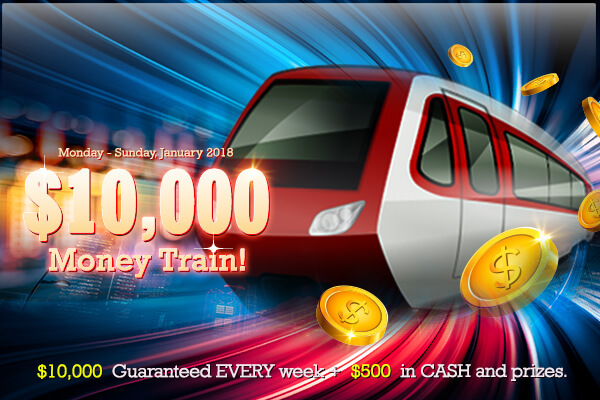 Jump on the $10,000 Guaranteed Money Train this week in the Main Bingo Room and you could be walking away with $10,000's in cash. What You Need to Know Before You Book Tickets - There's tons $25-$150 Guaranteed games, each week a total of $10,000 in GUARANTEED REAL CASH will be paid over the course of this promotion. BOOK YOUR SEAT NOW, join us in the main room every day and be on the lookout for the promotion patterns, besides the fantastic jackpots, you could be one of the FIVE lucky players to receive $500 in EXTRA prizes in the weekly draw. Ka-Ching! Since this is a random draw, all players who hop on the money train and with at least one ranking point will qualify to be one of the winners. Prizes: 1st Place: $200 CASH, 2nd Place: $100 CASH, 3rd Place: $100 BBs, 4th and 5th place: $50 Bingo Bucks each. This entry was posted in Blog on Jan 17, 2018 by Canadian Dollar Bingo.